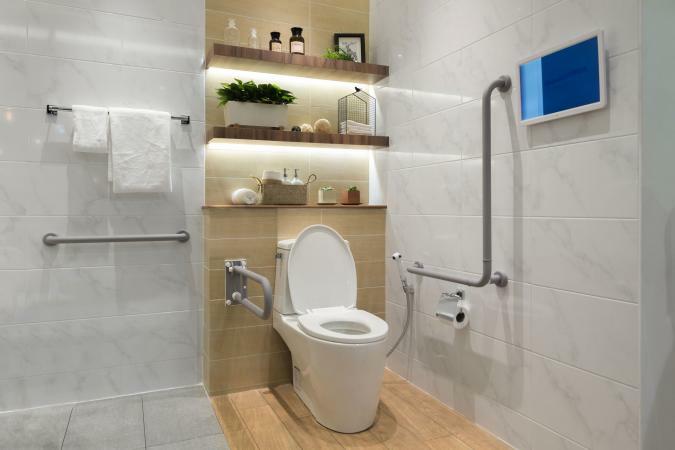 To properly design and build an American with Disabilities Act (ADA) accessible bathroom, you need to get fixtures that meet ADA codes and standards. From sinks to toilets to shower stalls, learn the types of fixtures available for your bathroom. Bathroom fixtures are defined as the permanent, large non-faucet components of the bathroom. This includes the toilet, sink, shower and tub as well as any vanities or cabinets. Each of these fixtures is available in an ADA-approved version perfect for handicap bathrooms. 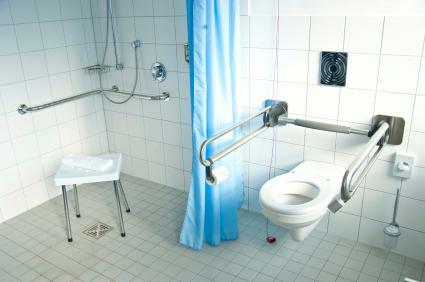 All toilet companies make several ADA-accessible toilets, many in several styles and features. The key is the height of the toilet. While standard toilets may only measure 14-inches to the rim, an ADA accessible toilet will measure 17-inches, giving a few extra inches of height that can allow easier lowering onto the seat or transferring. Toto's Promenade - Toto's Promenade is a classic style, two-piece toilet that is also available as an Eco version. Toto's Clayton - Toto's Clayton is a traditional style, two-piece toilet with a low-water flush. Toto's Guinevere - Toto's Guinevere is a traditional style, one-piece toilet with an easy-to-clean finish. Kohler's Archer - Kohler's Archer is a transitional style, two-piece toilet. Kohler's Cimmaron - Kohler's Cimmaron is available in both one and two-piece styles and features Kohler's newest flushing technology. American Standard's Cadet - American Standard's Cadet is a two-piece toilet with high efficiency and low consumption. Toto drop-in sinks - Toto makes several varieties of standard, drop-in sinks that are ADA-compliant. Toto wheelchair access sinks - Toto makes a wall-hung sink that slants back to allow extra room for wheelchair users. Kohler's Caxton sinks - The Caxton is Kohler's classic and popular undermount sink. ADA-accessible shower stalls need a flat threshold for ease of transfer or to allow wheelchair access. This can be accomplished through an entire, acrylic shower surround, or by using a shower base with your choice of wall materials. Grab bars, moveable shower heads and a transfer seat are also acceptable options. Barrier Free Transfer Showers - Barrier Free makes several varieties of transfer showers with multiple features like positionable grab bars. Barrier Free Roll In Showers - Barrier Free's roll in showers are one-piece shower units with no threshold, which allows wheelchair access. Sterling's Advantage shower base - Sterling's Advantage is a shower base with no threshold that can be used with any style shower walls. Palmer's Sink Legs - Use Palmer's Sink Legs with any style top for a wheelchair friendly sink and counter. You may also use the sides as grab bars. Adaptive Living Store - This store has ADA-compliant vanities in a variety of sizes and finishes. Not every handicap-accessible bathroom will look the same. Design a bathroom that fits your mobility and accessibility needs, both today and in the foreseeable future.